Issue #3 of Veggie Dog Saturn! This issue features yours truly suffering an existential freakout which inspires me to vacation to Toronto for a week with friends. 30 plus pages of Canadian accents, naked octogenarians, and 12 hour bus rides! Printed on newsprint with a color cardstock cover and bonus Gasoline Alley parody comic on the back cover! $3.00 postpaid to the address at the bottom of this page or through paypal (veggiedogsaturn@gmail.com). This entry was posted on Monday, June 15th, 2009 at 4:59 pm and is filed under Art, comic, For Sale. You can follow any responses to this entry through the RSS 2.0 feed. Both comments and pings are currently closed. 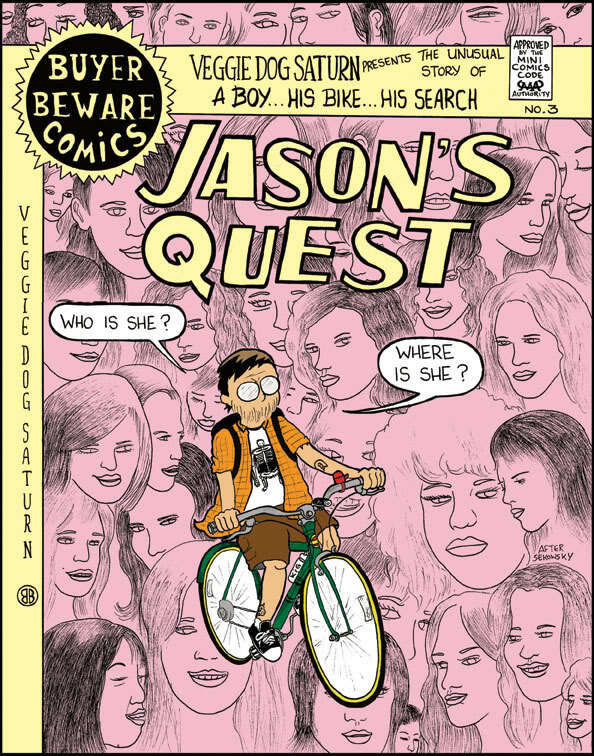 Hi Jason – Got a chance to read “Jason’s Quest”, and it was really nicely done. A memoir comic about an actual adventure (not just the mundanity of life) is a real treat! This had great production, too – the newsprint interiors and period ads turned out really nice.